In this post we are going to explain how you can use Xero to see how much dividends you are able to pay yourself. For a dividend to be legal it needs to be paid out of company profits, if you have never made a profit you will not be able to pay a dividend. You can read more about this on our blog post ‘How to avoid paying illegal dividends’. Set aside 35% of the cash you have coming in from your clients to cover tax payments (VAT and Corporation Tax). Then you can take out your monthly salary, whatever is then left can be taken as dividends. This method doesn’t work for everyone though so if your finances are more complicated you can follow the Balance Sheet approach below. We want to focus on the bottom section, the ‘Total Equity’. Capital – This is the value of the original shares and investment in the company. When we incorporate company’s for clients we normally make this £1. Current Year Earnings – This is your net profit (sales less expenses) that you have earned since the start of your company’s financial year. Dividends Declared – This account tracks the total dividends that have ever been paid from the company. 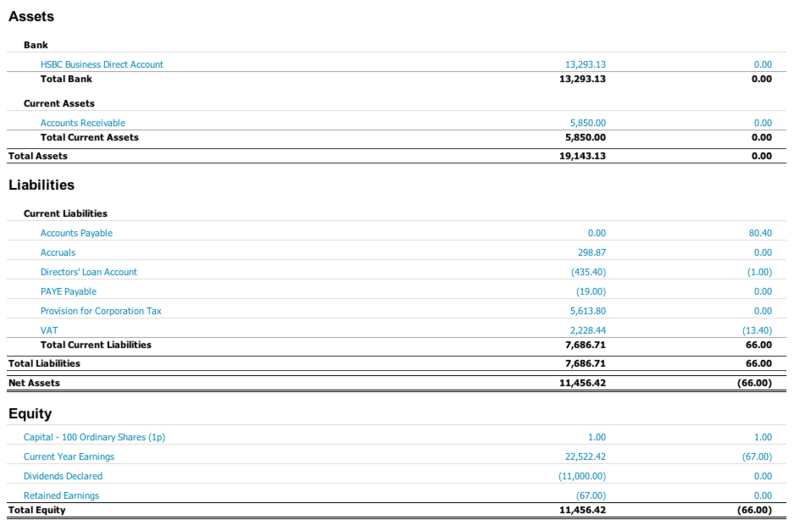 In this Balance Sheet above, the owner has withdrawn dividends totalling £11,000 since starting the company. Retained Earnings – Retained earnings are all the profits earned in previous years. So if the Current Year Earnings figure was to stay £22,522 up to the end of the year (ie if there was no more trading), then come the new year the £22,522 of ‘current year earnings’ would be added on to the Retained Earnings of -£67 to result in a new Retained Earnings balance of £22,455. To work out the available profits available to distribute you just have to calculate Current Year Earnings less Retained Earnings less Dividends Declared. Your answer should be the same as Total Equity less Capital. One final consideration you need to make is whether you owe any Corporation Tax that hasn’t yet been included in the accounts. If that is the case you can take your Current Year Earnings and multiply it by 20% (the corporation tax rate). In the above example that would be £22,522 x 20% = £4,504. If you ever struggle working this out do please get in contact with your Caprica Accountant and they will be happy to help you out. It’s not unusual for Contractors to be offered Permanent positions. Below we have written about the main implications of ‘going permy’ for your Company and future tax position. Will you pay more tax? 1. You can pay a small amount or even no National Insurance. If you go permy you will be paying National Insurance so will likely face lower take home pay. You can easily see the take home pay for a given salary at the listentotaxman website. 2. You can be strategic over how much you pay yourself and keep cash in the company rather than becoming a higher rate taxpayer. If you take a permy role you will lose these advantages. Though you will of course gain a greater degree of job security and if you are lucky some cushy benefits (do you remember getting holiday pay?). Should you close your company? One of the biggest decisions you will have to make if going permy is whether or not to close your company down. There are two main advantages of closing your company. First, you will free yourself from the administrative chores that come with operating a Ltd company. If you leave the company open but not trading you will have to prepare dormant company accounts each year and you will also need to submit an Annual Return to Companies House every year. The second advantage is that if you are a higher earner you can withdraw £25,000 of cash from the company as a capital gain rather than income (ie dividends). This can mean that if you are able to claim entrepreneurs relief you can pay just 10% capital gains tax to get your hands on £25,000. Even better the first £10,900 (2013-14 threshold) is totally tax free if you have had no other capital gains during the year. The main disadvantage of closing the company is that it will be gone forever. 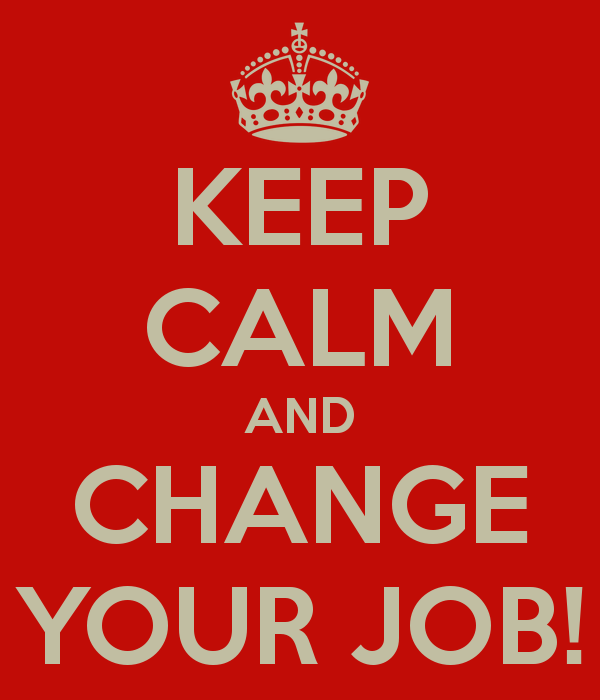 If you want to go back to contracting you will have to start afresh with a new company. A second disadvantage is that you have to settle all debts before closing the company. This will mean you end up paying your Corporation Tax bill long before the normal payment deadline. The final disadvantage is that you will have to take out any cash remaining in the business all in one go. If you have less than £25,000 that’s no problem. If you have more than £25,000 you will have to take the excess as a dividend and be taxed in the normal way on a dividend (25% income tax on the value of the dividend). If you have a lot more cash than £25,000 in the company it might be worthwhile appointing a liquidator they aren’t cheap but they will be able to ensure all cash paid out the company is in the form of capital gains rather than income. Our advice is that if you intend to go back to Contracting in the next 24 months you will be better off keeping your company open. If your Contracting days are over then you may as well close down the company. From a PAYE perspective moving form your Ltd Company to a permy role is pretty straightforward. All you will have to do is give a P45 to your new employer. If you are a Caprica Online client we can prepare a P45 for you in no time at all. It takes about three months to close a company (or strike-off to use the technical jargon) from the point it stops trading. A final set of tax returns and accounts have to be submitted to HMRC once you stop trading. You have to remember to cancel your VAT and PAYE registrations too. You will likely have to complete an income tax return for the tax year that you are part permy part Contractor. How Caprica Online can help? If you are a Caprica Online client we can shut down your company for you for a one-off fee of £350 + VAT. This will include making sure you are doing everything as tax efficient as possible and we will handle all the paperwork. Alternatively if you want to keep your company going we offer an inactive company package for £30 + VAT per month. Under this we will do the necessary work to keep the company alive but inactive ready to be re-awakened whenever you want. We always recommend that clients pay VAT by Direct Debit. This ensures that the payment isn’t forgotten and it also gives you a few extra days to pay. If you want to pay your VAT by direct debit just let us know when we ask for approval to submit the VAT on your behalf. 1. By BACS – the bank details can be found here. 2. By Debit Card – details can be found here. Make sure you use your business debit card not a personal one. In both cases you will need to use your company’s VAT number as a reference. You will be able to find this on the return that we send you after submitting. It will say on your VAT certificate which periods you fall into. If you like we can always change these for you. It normally makes sense to have your VAT reporting periods coincide with your company year end period. So if you have a June company year it would be best to have a December / March / June / September VAT reporting cycle. For illustrative purposes we will talk about a return that covers the period of 1 October 2013 through to 31 December 2013, which falls into the December / March / June / September period. 1 January 2014 – This is the point from which you are able to submit your VAT return for the period. 15 January 2014 – This isn’t an official date but it’s usually around this time that your dedicated Caprica Online accountant will be in touch with either a draft VAT return or giving you a gentle nudge to update your Xero account so that they can prepare your return. 7th February – Your VAT return must be submitted 1 month and 7 days after the VAT quarter end date. Payment will also be due on this date unless you pay by Direct Debit. We would always encourage clients to pay their VAT by direct debit. This is partly to ensure that payments are made on time but also because you get a few days extra to pay. The reason for getting extra days to pay is because HMRC need a few days after the submission deadline to queue up the direct debit payment. Trading through a limited company has great tax advantages (see our guide on getting paid by dividends) but comes with extra responsibilities and tax matters to get your head around. This post lists out the annual compliance jobs limited company directors need to complete to stay on the right side of HMRC and Companies House. Below are the minimum requirements that all limited companies are required to adhere to. Bear in mind that companies registered for VAT or as employers have additional filing responsibilities. The annual return is a small document that has to be delivered to Companies House every year, normally around the anniversary of your incorporation. It covers basic information like the name of the company, your accounting year end date (or reference date in company law language), company address and what you do. It also requires a few trickier technical details like the number of shares held by the shareholders and the original cost of those shares. If you want to find out when your next annual return is due you can easily see on Companies House’s WebCHeck system. Small companies are required to submit abbreviated accounts to Companies House every year. The abbreviated accounts comprise a balance sheet as at the companies year end date. This balance sheet summarises the assets and liabilities of the company at a particular moment in time. There are lots of templates around for preparing the document itself but the hard part is working out what numbers enter on your balance sheet. In our, admittedly biased, view that’s where you need an accountant. Annual accounts need to be prepared carefully under UK accounting standards and unless you stay on top these it’s easy to make a mistake. Abbreviated accounts need to be filed with Companies House nine months after your year end date. If you want to check the deadline for your company you can also find it on the WebCHeck service. Companies are required to submit an annual corporate tax return to HMRC. This takes the shape of a fairly unfriendly technical form. At it’s simplest it involves inputting annual profits and adjusting them for any assets bought over the year (and sometimes in previous years). At it’s most complicated you have to choose between a vast range of profit adjustments for all sorts of disallowable expenses (eg company incorporation costs) and tax allowances. In most circumstances corporate tax returns are due a day later than the annual accounts (ie. 9 months and 1 day after year end). As part of our limited company accounting packages Caprica Online Accountants take care of all the above forms for a fixed monthly fee, providing piece of mind for small business owners so they can focus on growing their business knowing a qualified Chartered Accountant is dealing with your accounts.